I am loving the midi length trend! I have been seeing so many midi length dresses and skirts that I think this is going to be a huge trend for fall. I love the floral pattern of this ASOS midi skirt. I am loving all of the fall trends that I am starting to see but it is so hard to think about fall clothes when it is 100 degrees out and sooo humid here in Florida. I literally start sweating just from walking to my car! I can not wait for it to cool down! On another note I filmed a hair tutorial (scroll down) for you guys of the side braid which I have decided to name side twist braid because I have no idea what it is actually called. It really isn't a braid but we'll just go with that name! Anyway It is so easy to do and I hope it is helpful! Filming hair tutorials is really a weird thing for me. I find it so awkward sitting in my bathroom talking to myself!! Top: F21, Necklace: Olive and Piper Thanks for reading! Have a great weekend! Gorgeous look- that skirt is amazing! Such a feminine look, love it! Great tutorial, I actually wear my hair like this a lot..
P.S. I wish I had your hair! Gorgeous! I love this look SO much. Beautiful mix of colors. And can I just say I'm OBSESSED with your hair? 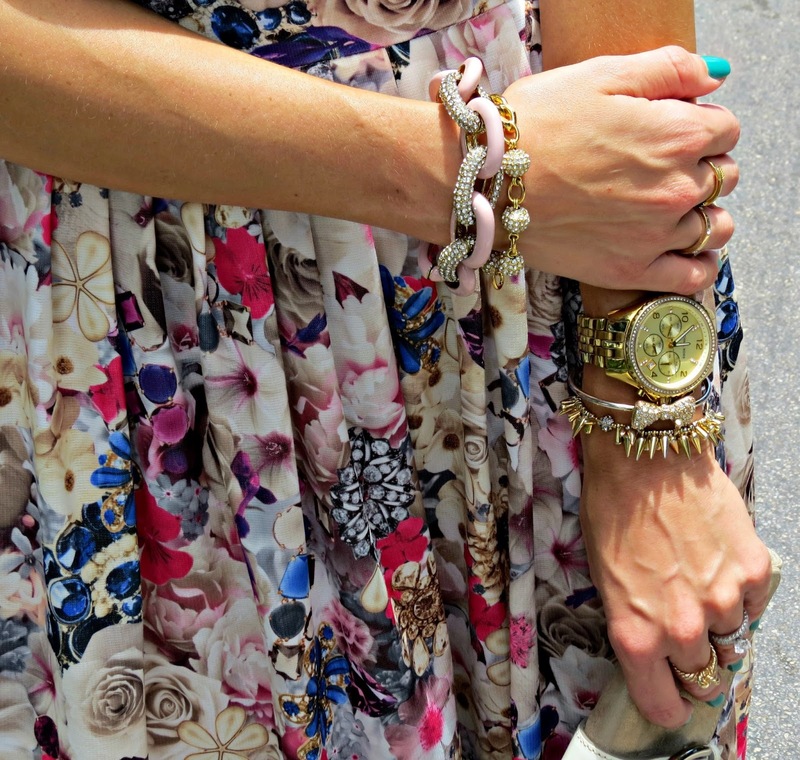 Love the print on the skirt, and the darling arm candy! Thanks for the tutorial! I think midi skirts are such a great trend! They're ladylike and classic and this one looks fab on you Jade. Oh this is gorgeous! I'm in love with this skirt! I love this outfit! I love the flowy top and skirt! That floral skirt is so cute! Love the floral midi skirt! So pretty! I love love love this skirt - so cute! Here it's also extremely hot, craving for a mild autumn! hi just found your blog and already followed it! it means the world to me, btw love your style and the hair tutorial is so helpfull!